Avid hunters and shooters are very familiar with this logo. Fans of Browning products will enjoy this licensed Browning Buckmark Logo Neon Sign. This neon sign displays the Browning products trademark logo of a deer head. Ideal for a office, den, Man Cave, game room, home bar, garage or other favorite room. 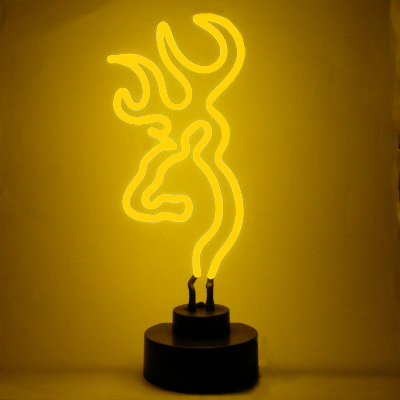 This Browning buck logo neon light is a tabletop neon sculpture, color approved by Browning and plugs into a standard electrical outlet.